When designing the perfect outdoor kitchen center, how about using counter intelligence? This is something our design professionals employ when engaging with clients and trying to understand how they intend to utilize the counter space on their newly installed outdoor kitchen. Factors influencing the dimensions of the counter include the number of installed appliances, number of desired electrical outlets, desires seating spaces, will there be a sink and water, trash receptacle etc. Once these housekeeping items have been determined, we than go about creating an adaptive and responsive design that is fully integrated into the overall theme of the outdoor expansion under consideration. Material finish choices are selected and accommodations for electricity and gas hookups are established. 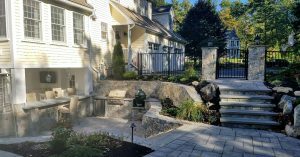 To learn more about how we can design and install an outdoor kitchen as part of your outdoor expansion project, contact us at 781-591-0300 or vern@ivystudioiMA.com. Bon appetit!